In the early 1500s AD, Portuguese ships under the rule of Charles V managed to capture the important seaport of Mombasa in Kenya, as part of their plan to control trade between India, Africa, and Europe. Mombasa shipped out gold, ivory, seashells, and enslaved people, and Kenyans bought cotton cloth, steel knives and needles, Indian medicines, and glass beads. But by the 1550s, Arab tradersfrom Oman, in the Arabian Peninsula, drove the Europeans out and controlled Mombasa themselves. 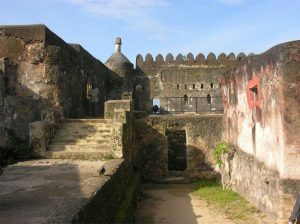 In 1593 the Portuguese built Fort Jesus at Mombasa, and used it to control the port. 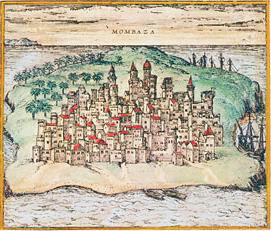 A century later, in 1698, Omani forces conquered Mombasa and Fort Jesus after a siege that lasted three years. Then they lost Fort Jesus again in a revolt, and regained it by 1730. All this fighting made East Africa much poorer. Oman also ruled Tanzania to the south and Somalia to the north. By this time, Portugal was not strong enough to control Indian Ocean trade anymore, and the British controlled trade through India, so Portugal stopped trying to get Mombasa back and just stuck with controlling Mozambique, further to the south. At this time Kenya was divided into a lot of small kingdoms. The Omani sheiks forced all these small kingdoms to do what they said. 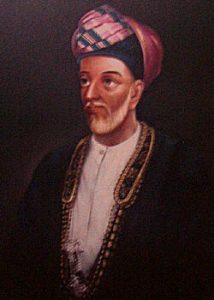 By 1839, Sheik Seyyid Said actually moved from Oman to Zanzibar, an island not far south of Mombasa, so he could control his African land more directly. Sheik Said organized big plantations growing cloves and other spices, and also sold ivory. He also sold a lot of Kenyan people as slaves. But that didn’t last too long. In the late 1800s, the British forced the Sheiks to stop selling slaves. Then the British started telling the Sheiks what to do about everything. In 1895, the British decided to run Kenya directly as a British colony called British East Africa. They started to build a railroad through Kenya, and many Christian missionaries came there and started schools. About 1900, the British encouraged Kenyans to start growing both coffee and tea on their plantations. The British forced many Kenyan men to go fight in Europe during World War I, where about a quarter of the Kenyan soldiers died. After the World Wars, people in Kenya wanted to get free of Britain. They started a revolutionary group called the Mau Mau. 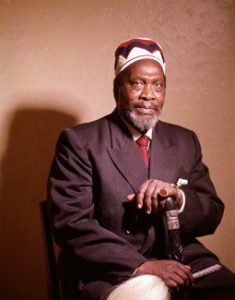 Jomo Kenyatta was one of the Mau Mau’s leaders, but the British put him in jail. There was a lot of terrible fighting. In the end, though, the Kenyans won their independence in 1964. It was supposed to have a democratic government with elections, but really Jomo Kenyatta ruled Kenya until 1978, and then Daniel arap Moi ruled until 2002. Recently people in Kenya have been trying to have real democratic elections. In 2013 the people of Kenya elected Jomo Kenyatta’s son, Uhuru Kenyatta. Cite this page: Carr, K.E. History of Kenya – African History. Quatr.us Study Guides, May 23, 2017. Web. April 19, 2019.